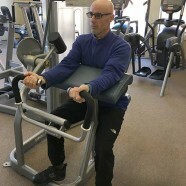 When doing a seated bicep curl with a Cybex machine, the biceps brachii, brachialis, and brachioradialis are all involved. The biceps brachii also known as the bicep muscle is a two-headed muscle and is responsible for flexing and supinating the forearm at the elbow. The brachialis is a large muscle that lies below the biceps brachii and assists the biceps brachii. The brachioradialis is a forearm muscle that flexes at the elbow and is also capable of pronating and supinating. Unlike other muscles found on the front of the human body, the biceps are responsible for pulling movements. Performing the bicep curl can make it easier when picking up an object, bringing food to the mouth, turning a key in a lock, starting your car or pulling or inserting a cork into a bottle. Boxing, climbing, canoeing and rowing are examples of sports that utilize this muscle. Be sure to keep your shoulders back and down. Do not allow shoulders to round forward in order to make the lift.